Since the nineteen sixties Haynes Manuals have been produced, predominantly manuals for car owners, however they have branched out into more amusing, if no less detailed, genre manuals. 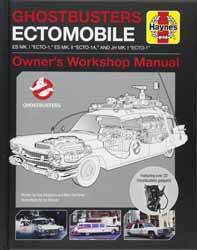 Most recently they have released the Ghostbusters Ectomobile Owners Workshop Manual (2017. 143 pages). I thought that this was an odd choice for a manual, after all the previous Star Trek, Star Wars and Captain Scarlet manuals had a lot of vehicles and equipment to choose from, Ghostbusters has pretty much one car. How wrong could I be? The book covers all the films, including the most recent one, and does an excellent job of covering the various vehicles and equipment. The contents are equally divided between informative text, schematics and pictures, including many close-ups of various equipment parts. There is also an added layer of ephemera which includes post-it notes from the characters as well as the occasional full-page essays by the in-film characters. It all makes for a nicely layered product. Apart for the lack of dimensional stats there is enough information in the book to have a stab at building your own Ecto1. Each of the elements which made up the Ecto1 is examined in detail. I was surprised to discover that a lot of the equipment are actual instruments. I looked a couple up on-line and they really exist, or at least existed, given the age of the first film its probably quite difficult to get hold of original pieces. But this level of detail does add weight to the overall book. The first fifty-nine pages are devoted to the first film, with changes made for the second filling up pages sixty to ninety-nine. Pages one hundred to one hundred and forty-three covers the most recent reboot. So, if you ever needed to know the differences between the vehicles and equipment in insane detail then this is the book for you.